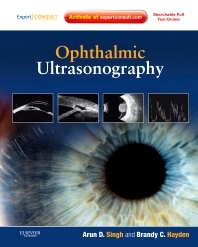 Written by and for ophthalmologists and ophthalmic ultrasound technicians, Ophthalmic Ultrasonography -- by Arun D. Singh, MD and Brandy C. Hayden, BSc, ROUB -- provides all the guidance you need to make optimal use of this imaging technique to evaluate diabetes-related ocular disorders, cataracts, macular degeneration, and much more. Its unparalleled image collection and detailed video clips capture the characteristic ultrasound presentation of a full range of ocular disorders. An easily searchable, atlas-style format and online access to the complete text at www.expertconsult.com make this the perfect "how-to" guide for honing your skills and obtaining accurate diagnoses! Broaden your knowledge and sharpen your skills with comprehensive coverage of ultrasound applications across all sub-specialties in ophthalmology including cornea, glaucoma, retina, pediatric, tumors, and trauma. See how ultrasound compares to images captured via other modalities such as OCT through numerous side-by-side examples. Master the fundamentals of ultrasound with chapters devoted to exam techniques, practical considerations, and effective equipment use for optimal scan results. See how the full spectrum of diseases present through more than 400 high-quality images - half devoted to ultrasound and half devoted to color clinical images and examples of other imaging techniques. Employ the very latest ultrasound technology such as high-resolution screening, ultrasound biomicroscopy (UBM), and Doppler techniques. Observe sonographic evaluations in real time with 20 video clips that demonstrate key techniques and findings. Access the full text online including tables, figures, images, videos, and more at www.expertconsult.com.